For some reason, I don't get a lot of comfort or peace knowing Obama is so concerned about our brains. There is more to it than only mind control. There is this little thing called TRANSHUMANISM and the SINGULARITY. (See more of that here: The Hideous 'BAM' In Obama: Map Your Brain For Your Own Good) -W.E. President Obama is making new investments in the “BRAIN” Initiative — a bold new research effort to revolutionize our understanding of the human mind and uncover new ways to treat, prevent, and cure brain disorders like Alzheimer’s, schizophrenia, autism, epilepsy, and traumatic brain injury. Look at the graphic posted [bottom of this page] on Obama’s White House site and tell me we don’t have anything to be concerned about. 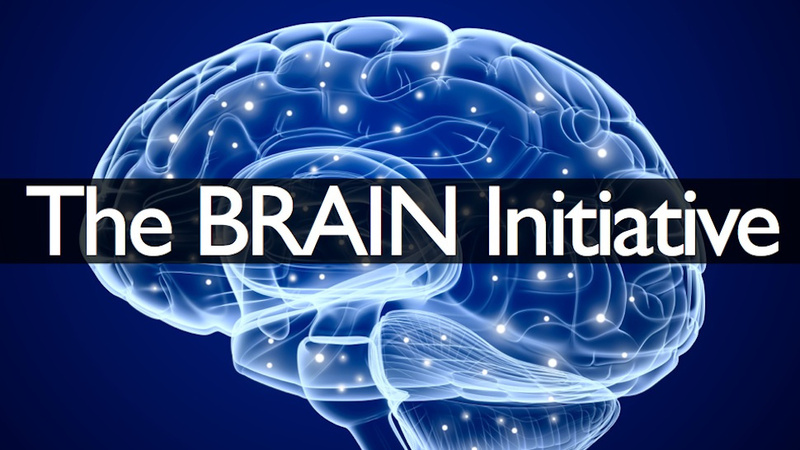 The Brain Research through Advancing Innovative Neurotechnologies, or BRAIN, as the project is now called, aims to reconstruct the activity of every single neuron as they fire simultaneously in different brain circuits, or perhaps even whole brains. If one knew that the human race and all other species were going to go extinct through natural consequences, or were going to be wiped out, a Noah’s arc would likely be built in order to reconstruct the planet in someone’s, certainly not God’s, image. If one can read through the lines, the following quote from the project speaks to this possibility. Having read volumes on this topic, it is quite clear that this technology is a decisive first step toward controlling an organism by controlling the processes which controls thought. “…Nanoprobes bearing several dozen electrodes, for instance, could be stacked to probe hundreds of thousands of recording sites and transmit data wirelessly. Selective Serotonin Reuptake inhibitors (SSRI’s) are absorbed by the cells upon consumption. What’s reuptake? “It’s the process in which neurotransmitters are naturally reabsorbed back into nerve cells in the brain after they are released to send messages between nerve cells. A reuptake inhibitor prevents this from happening. Instead of getting reabsorbed, the neurotransmitter stays — at least temporarily — in the gap between the nerves, called the synapse”. Ok,now I am going to make this simple. The serotonin is not stored within the cell membrane because of the nature of the SSRI. However, in the brain mapping project, the nanoparticles are embedded directly into the cell membrane where all proactive thinking and reactive thinking originates. The Brain Mapping Project has just described how they will control all thought and consequently all action. Site injections would be the primary means of disbursement and this modern day “invasion of the body snatchers” would do its work. Some cell sites could be enhanced and some could be disabled depending on the end game goal. This part of the technology has already been developed. See my previous investigation in to the genesis of this technology beginning with Jose Delgado whose technology was based upon frequency modulation. Different frequencies produce different behaviors resulting from different mood states. The globalist enforcement agents cannot go door to door and administer these silver bullet mind control injections. However, these changes can be ingested in a macro fashion through chemtrails and HAARP. There are researchers who are looking into the possibility that GMO foods are a conducting agent of this process as well. The jury is still out on the latter. In 1961, mind control researcher, Jose Delgado was able to implant the hypothalamus of a cat with a transducer and manifest an uncontrollable rage in the animal. Keep in mind that this technology is over 60 years old. One can only imagine how far this technology has come during that time. What becomes clear at this point is that through the Brain Mapping Project, they have learned how to bypass the brain’s safeguards and go directly into the cell membrane. In the second part of the mind control endeavor, it is clear that the researchers will combine a modern day application of Delgado’s original work alter the frequency of the cell membrane of an organism and control the origination point for all thought. And with Chemtrails and other disbursement strategies, the entire population can be impacted. This video also includes a discussion of how the globalists will block Trump from ever getting the nomination. One has to wonder if any aspect of this nature will ever be applied and could it be applied to this, the most controversial election in American history. Technology is neutral. What makes technology evil is the inherently sinful nature of man. At the State of the Union Message, Obama wholeheartedly endorsed the project. It easy to understand why. This is Obama’s Brave New World. This will prove to be evil incarnate.